Is Year Three the Most Important for Oregon Head Coach Mark Helfrich? There are coaches on the hot seat in every college football season. Although Oregon football head coach Mark Helfrich isn’t listed in AthlonSports.com‘s College Football’s Coaches on the Hot Seat: Spring Practice 2015, he may be entering his most pressure-filled season to date in 2015. His hot seat is one that is filled with the high expectations of a program that hasn’t been in the championship conversation for very long. Expectations for Helfrich were very high heading into the 2014 football season. 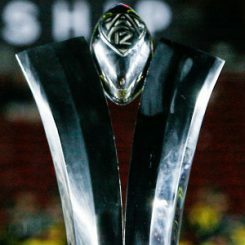 Oregon did answer the call by winning a Pac-12 Championship and the Rose Bowl, and appearing in the finals of the first ever college football playoff. But are expectations for the 2015 season even higher? Helfrich went a long way towards answering critics and proving himself last year, but he still has a bit of work to do before he can be considered another great coach in Oregon football history. Some of the areas where he still must prove himself are preparing a quarterback that isn’t Marcus Mariota, avoiding a team mindset of “resting on laurels,” and winning with his own recruits. Here are some things to consider in these three areas. 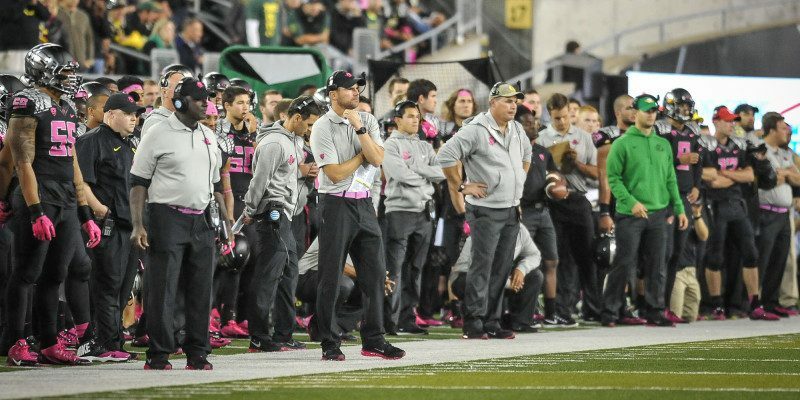 For the first time under Helfrich, the Ducks will operate without Mariota running the offense. 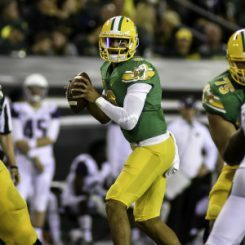 Because nobody on the 2015 roster has played a significant number of snaps at quarterback, the upcoming season will show how well Helfrich and his staff can prepare an inexperienced quarterback to be the starter for Oregon. This will also show well Helfrich and his staff can adapt to players with different abilities — the 2015 starter isn’t going to be like Mariota. 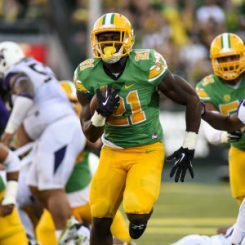 If Helfrich and his staff can adapt the offense to a starter who has never seen true playing time at Oregon, while keeping it as potent as it has been in the past, they will prove to the team, players and future recruits that their system doesn’t require a particular quarterback to run it. Will the 2015 team have the mindset of an underdog or feel entitled because of last year’s accomplishments? The expectation levels are higher than ever in Eugene. Every season is national championship or bust. When expectations are that high, it means your program is established, and that is what Oregon is. This is new for Oregon football. Compared to teams like Alabama, USC, Texas, Michigan and Ohio State, Oregon is the new kid on the block when talking about teams that can compete for a championship year in and year out. 2015 could be a pivotal year to see which way the Oregon football program is trending. Can Helfrich and staff rely on the loss of the championship last year to fuel the players going forward? Or will they lose the focus that got them to the levels the team reached in 2014? It is critical for Helfrich and staff to find what will motivate the 2015 team to match last year’s success. Heading into the 2015 season, there are only a few Chip Kelly recruits left. The experience and players that Helfrich and his staff have assembled will be the majority of what is on the field in 2015. The games that are won this season will tell everyone how well Helfrich is recruiting. Helfrich had the great opportunity of working under Kelly as he led the Oregon football program to the next level. When Kelly left, Helfrich was unfortunately labeled a coach that was reaping the rewards of Kelly’s work. If Helfrich can continue to win games at the level he has the last two years with a majority of his own recruits, he will lose that label pretty quickly. These three areas will define Helfrich as a head coach. If he continues to win games and compete for championships in 2015, he will go a long way towards establishing himself as one of the great coaches at Oregon.